Lambo doors & door conversions. Turn heads with one of the ultimate style door systems. "Door conversions - An open and shut case!" Why stick with the standard doors when there are so many door conversions open to you (if you pardon the pun). Here are the pros and cons of the Lambo or scissor door, suicide doors and gullwing door conversions. Kits are available for just about every popular type of car and there are also many universal fitting kits available. Many companies offer a fitting service but which door conversion kit is right for you? Most kits require cutting of the interior wing and a small amount of spraying so you need to be reasonable confident if you decide to go for a DIY fit and you should add a door conversion before you do other paint and bodywork as these may need touching up after the door conversion is fitted. Although these doors look cool they can be a pain in low roof car parks or when people try to pull the door open as normal! This must rate as on of the coolest styling additions available for your car. Now pretty much any car can have lambo style lift up doors. We think this is an excellent product and will really make your car stand out. Lambo Doors or vertical lift doors. Lambo style or vertical doors typically pull out a little like ordinary doors then they lift up over the roof line like someone doing the butterfly stroke. Different kits are available and some allow the door to go completely vertical and others give the option of a fairly normal pull outwards to 60-75 degrees as well as swinging upwards to 90 degrees. The kits need to be matched to the weight of the door (otherwise it will fall on you as you get in) and also the amount of width available in the door hinge area. Lambo doors can be hard to close from a seated position so thought has to be given to the handle positions. Drop handles will make this easier, or you could opt to go for the very impressive electronic opening and closing lambo doors. Lambo doors are not practical on the rear doors of a 4 door car as the rear doors will swing up and over obscuring the front door. 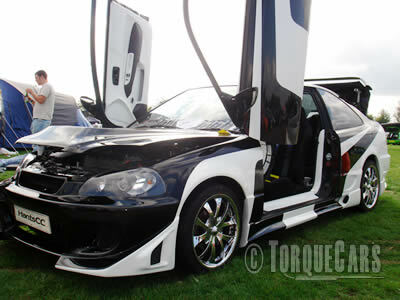 You could have Lambo doors on the front and suicide doors RX8 style on the rear with a little imagination. It is also possible, although very expensive to have reverse lambo doors on the rear with Lambo doors at the front. Powered self opening/closing Lambo door kits are becoming available and will soon be the must have accessory. These take the hinge to the other side of the door. They are called suicide doors because they open behind you exposing you fully to oncoming traffic whereas a conventional door opens between you and on coming traffic. Suicide doors are relatively straightforward to live with but you will find yourself reaching for the wrong side of the door when using other peoples cars which can look a little strange. For more information on this see suicide doors. The hinge of these doors is at the top of the door and the door swings out and upward much like the wings of a bird in flight. 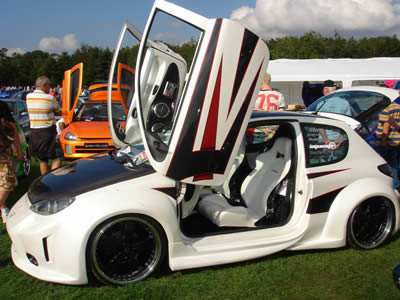 These doors look as impressive as Lambo style doors but have not become as popular. This style of door was popularised in the Delorean from the Back to the Future movies. One thing to bear in mind with this is that the doors require a slightly wider opening space so if you parked in a car park and the cars either side of you parked too close you'd be unable to get into your car. Probably best not to fit these on your supermarket run car! For more information see Gullwing doors. If you require car specific advice or suggestions on the best kits please join our friendly forums where our resident modders will be happy to help out and pass on tips and suggestions. We also enjoy reading about your projects and ideas so let us know what you are up to in the forum. what size degree is the first car doors is ?? ?